Running in cold weather is neither good nor bad as long as you are healthy and engage in proper safety measures necessary for the condition of the ground and the temperature of the air. Most of the issues provoked by running in cold weather involve breathing difficulties, especially in those with asthma or exercise-induced asthma. Sometimes winter air that is too-rapidly inhaled may cause bronchoconstriction due to the air's dryness and reduced temperature. Depending on the temperature of the air or the wind-chill number, even the healthiest runners can experience breathing problems while exercising outside in the winter. Wearing a thin ski mask when running reduces aggravating effects of cold, with the inside of the mask being warmed with exhaled, moist breaths. Wrapping a lightweight scarf around the lower face and nose also provides adequate protection but is not as effective as a face mask. Remembering to breathe through the nose rather than the mouth will also lessen potential breathing difficulties. 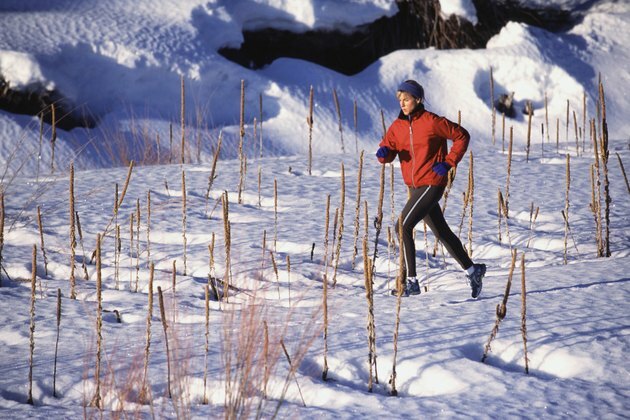 In addition, in cold weather, engage in endurance running instead of short, speedy bursts of running, to lessen the amount of cold air rushing into the lungs. Don't head out the door to run several miles in below-freezing temperatures without first performing stretching exercises. When that brisk air hits muscles that haven't been properly warmed up, the combination of cold and reduced air pressure causes joint tissues to expand, restricting movement and possibly provoking soreness later in the day. Cramping and spasms are also probable if runners throw muscles into an intense running session without first fueling them with nutrient-rich blood and energizing oxygen stimulated by invigorating stretching exercises. When it is especially cold outside wearing layers keeps the body warm and less prone to frostbite or hypothermia. Wearing a hat is probably the best way to maintain a decent body temperature, as you lose more body heat through your head than any other body part. Many runners wear polypropylene clothes when running because this material is comfortable and good for keeping dry and warm. Soft, fleecy garments such as sweatshirts and pants make suitable, cold-weather running clothes, as well. You may have to take several practice runs to decide what amount of clothing works best for you in certain temperatures. Also, be careful when running on wet pavement and avoid running in snow if possible. Because runners still perspire in cold weather and cold air is much dryer than warm air, staying properly hydrated is another key component of running safely in winter. Intense respiration also releases high amounts of moisture extracted from the body. In addition, maintaining hydration reduces the risk of hypothermia and breathing difficulties. To avoid dehydration, take a bottle of water or Gatorade along with you when running and stop often to take several swallows before continuing with your run. Can You Get Sick From Running in Icy Weather?